This article was submitted by Club Member Janette - Many Thanks to her. The pictures are "Thumbnails" - click on pictures inc. the one at the top of the page and you will see a bigger picture. White with a broad crest. The underside of tail and wings are yellow. Or by the Adult bird's eyes once they reach about two+ years old. Female will have reddish-brown iris. Male the eyes are jet black. Mature female has a smaller head and beak than the male. Umbrellas aren't particularly good at talking. As a pet they need loads of constant attention. They call them the "Velcro Bird" and that's exactly what they are like, very clingy. Very loving but unpredictable when in "Breeding Mode". NOT for the beginner Breeder/ Bird-keeper or as a "First Pet Bird"! when there's a rain shower. Forest, Open Woodland, Mangroves and Swamps. Fairly noisy bird, initially shy. Quite a destructive bird, thin mesh is a Big "No No" with these birds, they can chew thru. almost anything. Double, heavy-guage, parrot-proof wiring a must. Esp. if you have other birds in an adjoining Aviary. Ideally, provide a spacious flight with shelter - 18 x 6 x 6 ft is an appropriate size. Clean shavings and pieces of wood for them to chew are adequate for the nest box. Walnuts are a special favourite but have to be halved for them, as they don't seem to be able to crack them open too well. Fruit and vegetables, love sweetcorn, peas and grated carrot mixed with egg food. A calcium supplement, Daily essentials 3 + a Pro-biotic once a week. CLUTCH : is normally two eggs. Both birds sit the eggs in turn and both parents feed the chicks. Chicks Fledge - Around 14 weeks but still continue to be fed by the parents for weeks afterwards. Age: Usually ring them about 2-3 weeks old. Some Captive-bred, domesticated Umbrellas don't sit their eggs well and if this is the case then it's best if the eggs are removed and put in Incubators. where it is beyond help. Rarely, altho. it can happen, the parents manage to successfully rear both chicks. Often they may feed them happily and regularly up to 2 weeks but often not past 3 weeks. esp. if the weather is cold and they don't have their parents to keep them warm. so then it does not "beg" for food and therefore the parents are not stimulated to feed it. This will help save it's life and also speed up it's metabolic rate to help kick-start it's "feed response"
when you start to feed it. 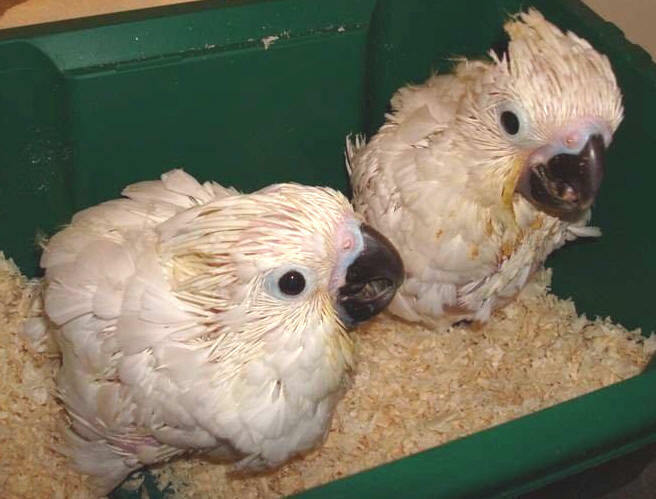 Some breeders are lucky and do have Umbrella pairs that will parent-raise their chicks. A hand-reared baby would be ready at around sixteen weeks old to go to a new home.